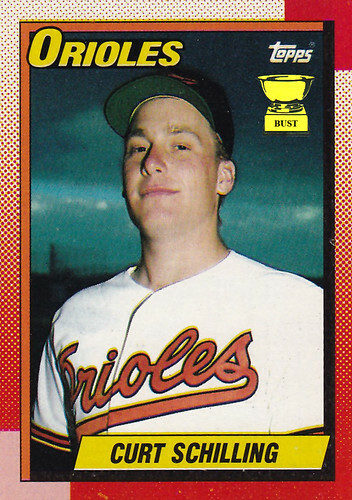 Orioles' scouting report on young right-hander Curt Schilling, circa 1990: "Expert at buttoning up his jersey all the way. ... Raw. That describes his talent and how he likes his steaks. ... Fastball could use some work. So could his eyebrows. ... We're hoping he'll be able to grow into a spot in our rotation. He's hoping he'll be able to grow some facial hair someday. ... Got ketchup on his sock the other day. Made a big production out of it. ... His sleeves go longer in a game than he can right now. ... You know what? Screw it, let's trade him. He'll never accomplish much." I love that card. Here's a guy with an 0-4 record and an 8.49 ERA, and yet look at the smug look on his face. "Just wait, you'll see."